Enrollment is terrible, it’s always been terrible, it always will be terrible. On Monday, just before the winter class catalog was released and less than a week before students received their enrollment appointments, the administration announced that Advanced Placement and International Baccalaureate test credits will no longer count toward advancing students’ enrollment priorities. For those who relied on high school credits to keep them a little ahead of the game, the hour before their enrollment window begins – during which you refresh the Schedule of Classes page over and over again, staring down the last open spot in a class limited to 150 people – is about to get a little more stressful. We could have one computer – that’s singular – charged with managing more than 20,000 students’ enrollment. That computer could break for a quarter of the time it was supposed to be active within a two-week period. Administrators could refuse to abscond late enrollment fees and place a $3 charge on students for something that wasn’t their fault. But this isn’t 1978 anymore. While the conditions might be equally miserable, the problems we face today are worlds apart from those faced by Thaler and her peers. 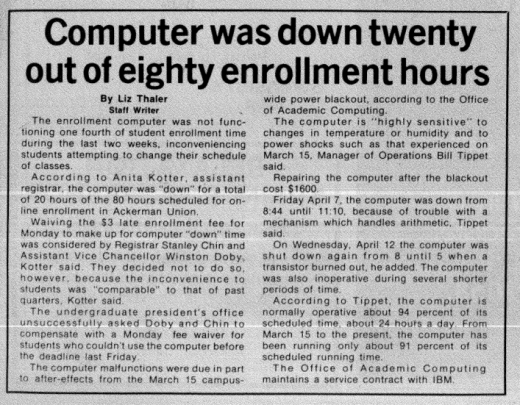 The advent of MyUCLA – and the widespread availability of computers necessary to make it possible – has removed most technological difficulties, but only to give rise to a complicated system of values and exceptions that determine whether you are important enough to get into the classes you need. The policy change might feel very arbitrary, especially for students who expected their high school experience to count for something when enrolling in college classes – after all, that was the point of taking them, right? But the change reflects the increasing diversity of higher education. By most accounts, there are a multitude of good reasons for the change. AP and IB credits have long represented a gap in privilege between high schools that can and can’t afford to provide students with college-level classes. While both services have attempted to accommodate more underprivileged students in recent years, the gap remains. While students previously came from largely similar socio-economic backgrounds, the playing field today is less level and, in the grand scheme of things, prioritizing students who had the opportunities to take college-level courses in high school is far worse than arbitrary – it’s irresponsible. So if you find yourself looking back at the good old days – when a broken computer was the crux of students’ problems – with an air of nostalgia, then stop. You’re a classist. Literally.